Originally published under the title "Wir lieben die Türkei! Erdoğan ist der beste!" German Chancellor Angela Merkel's government has set a marvelous precedent in showing the entire world how a country should best care about the safety of its citizens traveling to, well, "different" foreign lands. 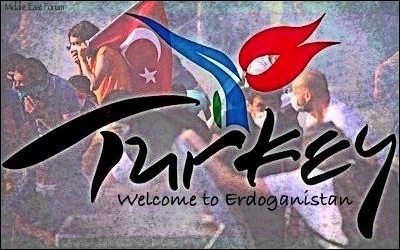 In a very smart move, the German Foreign Ministry added a new piece of travel advice to the "tips page" on how German tourists should behave while on a visit to Turkey: "It is strongly advised not to make public political statements against the Turkish state and not to express sympathy for terrorist organizations." Ironically, the advice came more or less on the same day a German reporter was deported from Turkey on the grounds that he was previously banned from entering the country. The German government should perhaps upgrade its travel tips on Turkey: "Do not make public political statements against the Turkish state. If you are a journalist, do not go to Turkey." Although the German Foreign Ministry's new advice was a smart move, it may fall short of preventing future diplomatic crises between Ankara and Berlin. It would do no harm if further pieces of advice were added to the tips page: "Do not drink alcohol like infidels while on a visit to Muslim Turkey. It would be better for your own security if you fasted or at least pretend to fast during Ramadan. You will have more fun and a better time while sunbathing on the Turkish Mediterranean coast if your wives wear the Islamic headscarf, remain in their hotel rooms and avoid swimming in public. T-shirts with script in praise of Hitler will further safeguard your well-being and may even build memorable friendships between yourself and the locals." The German government should upgrade its travel tips on Turkey. There is another problematic point about the German advice that "It is strongly advised... not to express sympathy for terrorist organizations." The average German sunbather logically is not expected to publicly express sympathy for the Islamic State of Iraq and the Levant (ISIL) – although many Turks do so and are not prosecuted. Berlin should have been more specific about this caution. A vague expression of empathy, even if not total sympathy, for ISIL will not necessarily put anyone in danger. If prosecuted for ISIL sympathies, the smart German tourist should remember to tell his lawyer to cite Prime Minister Ahmet Davutoğlu's notorious lines about ISIL jihadists: "Past anger, alienations and insults [against Sunnis] have caused a reaction [the emergence of ISIL]. Such an accumulation of anger [which resulted in ISIL] would not have existed if Sunni Arabs in Iraq were not alienated." Then there are the tens of millions of other Turks whom the Turkish government views either as terrorists or potential terrorists merely for not sufficiently admiring the government. The list is long and you may have a hard time weighing your words of sympathy for any terrorist or potential terrorist. Just stay on the safe side and keep repeating the lines "Wir lieben die Türkei! Erdoğan ist der beste!" [We love Turkey! Erdoğan is the best!] wherever you may be going in Turkey. You will see smiling faces and guarantee a prosecution- or deportation-free holiday in the European Union-candidate Turkey, and enjoy your doner or shish kebab in a relaxed atmosphere – with ayran, of course, forget beer. You may win even more hearts and minds if you can recite a couple of Turkish lines like "Biz Erdoğan çok sevmek" [We love Erdogan so much] or "Biz Türkiye çok aşik olmak" [We are in love with Turkey]. You need not thank this columnist for the advice but, back home, remember to thank Merkel for her useful travel tips.